Five points out of forty two became five out of forty five as Mossley's end of season blow-out continued in yet another goal pummelling fashion at Newcastle Blue Star. Thankfully I wasn’t on Tyneside to see it and as a consequence there’ll be no match report for this game. What I can tell you about it though is that Gareth Hamlet cancelled out Blue Star’s 6th minute opener on the half hour mark before things went downhill for the Lilywhites faster than a greased up Franz Klammer on jet powered skis. I'm not going to repeat the text I got when Mossley went 4 -1 down but suffice to say, it wasn't from a spectator happy with the ninety minutes that were breaking up a five hour plus round trip. The five goals knocked past Mossley by Blue Star takes the total in the goals against column to just nine short of the century. Of course it's a target you hope you never ever hit but I will admit that there's a hundredth of a percentage of me masochistically hoping that it's reached, purely so that I can strike it off the list of things I’ve experienced whilst watching Mossley; a list that includes items such as 100 goals for (done) and the Lilywhites hitting double figures for the first time ever in a game (something that will probably forever remain without a tick next to it). To keep the five motif that’s running through this piece going, it’s the number of games remaining for Mossley in a season that’s falling apart faster than a leper on a bungee jump. It would be nice to salvage a bit of pride before the curtain’s drawn over this campaign but who knows what will happen? This is Mossley remember where, like Thunderbirds, anything can happen in the next half hour. And the fourteen left after that. Mossley see out March with their longest trip of the season for their first (and possibly last) ever visit to the Kingston Park Ground - home of Newcastle Falcons rugby union club. Oh yes, and Newcastle Blue Star play there as well. That said we may have done better against the egg chasers. After all [sarcasm] the backbone of their game seems to be kicking the ball out of play as often as possible as well as over the bar [/sarcasm]. Only joking everyone! As most of you who are reading this will already know, Blue Star have announced their intention to drop back down to the Northern League at the end of the season, citing the costs involved in travelling from the back of beyond to civilisation every other week. It still remains to be seen as to whether their decision to relegate themselves will be ratified by the FA, although it's almost certain the they'll give their blessings given the palaver it would cause if they said "you're staying where you are". The Tynesiders currently reside in 11th position, three places and nine points above us. We've also faced them twice already at Seel Park this season, picking up a win and a draw. Hopefully we won't complete the set by coming away with a defeat. Of course that all depends on the game actually going ahead. Last week Blue Star's game with Curzon was abandoned when part of a stand took flight in high winds. Similarly inclement weather is predicted for tomorrow so those few Mossley fans making the trip up may get to see that rarest of sightings - a football match in Geordie land where one of the home supporters doesn't take their shirt off at any point during the ninety minutes. Prediction: As I'm not going this is a cast iron win for the Lilywhites. And I'm sure that you don't need me to point out the other error in the heading either. SPORTING stars are helping tackle sexual health problems in Oldham. Football and rugby players are throwing their weight behind a new sexual health campaign taking place at this weekend’s fixtures. It will see players and their supporters aged between 16 and 24 invited to have a sexual health check-up. The innovative campaign is part of the RU Clear? chlamydia screening programme, which encourages under-25s to be tested for the sexually transmitted infection. How embarrassing is that? Going to watch Oldham Athletic. Only now there's the added attraction of possibly getting an appointment at the clap clinic before you take your seat. Obviously they'll have to put some sort of disposable cover over it first. And how many times do you think someone will ask what numbered shirt their new French signing Chlamydia is wearing? Still, it will be fun spotting which players didn't get the "all clear." I'm guessing that they'll be ones celebrating any goals they may score by themselves. It may be spring but the bleak midwinter continues unabated for the Lilywhites. 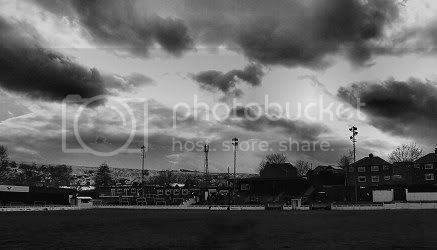 After their crucifixion at Bradford on Good Friday, Mossley proved that the second part of the Easter story – resurrection – was beyond them by falling to an almost as heavy defeat at home to Rossendale United. That the game was able to go ahead was due in no small part to the tireless dedication of a group of supporters who’d spent the hours in the lead up to the kick-off clearing a thick layer of snow off the Seel Park playing surface. Indeed, a hearty round of applause and a cyber slap on the back goes to those who volunteered for the near back breaking task of getting the pitch ready. As to whether or not they believed their efforts had been worth it by 4:45pm is only something they themselves will be able to answer. From the first whistle onwards the match had a definite end of season air to it, albeit a month or so too early, with neither side ever looking like troubling the score line. Given the heavy nature of the pitch this was perhaps to be expected but it was still poor fare for the supporters watching from the terraces. Some of whom were giving serious consideration to shovelling snow back on to the pitch at the interval in order to get it abandoned. And that’s how it remained until the one incident of note in an otherwise forgettable half handed Mossley the lead. In the 37th minute a left wing cross by Danny Ryan turned in to a shot in mid-flight and hit the angle of post and crossbar. In the race for the loose ball as it bounced back off the framework, former Mossley keeper Lee Bracey lost out to David Boardman by a fraction of a second and as a consequence sent the home sides forward tumbling to the ground. 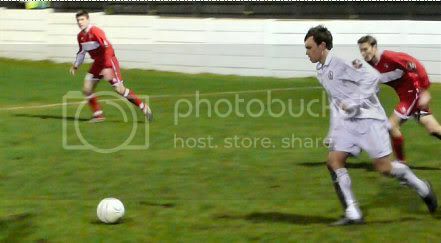 The referee had no option other than to award the Lilywhites a penalty which Lee Connor duly, and coolly, converted. The start of the second period saw a marginal improvement in the entertainment stakes with both teams flashing shots wide of the uprights and Gareth Hamlet drawing a save out of Bracey. After that initial flurry of ‘excitement’ though the game reverted to how it had been for the majority of the first forty five minutes and Mossley looked to be heading for a dull but most welcome victory. At least they were until the 71st minute when Dean Johnson surrendered possession cheaply on the halfway line and set in motion a Rossendale move that ended with substitute Lloyd stabbing the ball home from close range. And five minutes later the game was turned completely on its head when Eastwood took full advantage of being left unmarked in the box to fire the Stags in front. 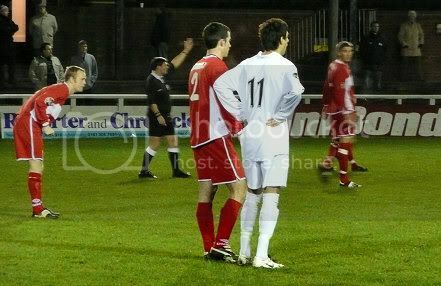 Having gone from looking the odds on winners to likely losers, Mossley began to throw more players into attack in an effort to salvage the game, and four minutes from time it was another substitute, Edgington, who exploited the lack of numbers in the Lilywhites defence to run half the length of the pitch and add a third goal to his teams total. And had it not been for an astonishingly poor miss in injury time by one of Rossendale’s goal scorers, Mossley would have been on the receiving end of their second 4 – 1 reversal in the space of four days. ... and leaves Ashley Connor wondering where the defensive cover has disappeared to. With Mossley having taken just five points from the last possible forty two and with relegation looking increasingly unlikely, the end of the season (and the chance to start building for the next) can’t come soon enough for the Lilywhites. If when reading this you’ve ‘marvelled’ at the increase in photographic content (if not in quality) it’s because it’s a desperate attempt to make the piece look bigger than it actually is. The reason as to why it ‘s so brief is because I really can’t be fussed to extend it; especially as the majority of conclusions to be taken from the game (the ones that I’d normally fill the report out with) are exactly the same as the ones for the last home game against Wakefield. Although you can add to that the fact that the pitch had a greater influence on proceedings and that Rossendale’s introduction of fresh legs to the match in the second half did go some way to tipping the balance in their favour (though if it hadn’t been for Mossley gifting them the ball and space on numerous occasions their impact would have been negligible). Other than that though everything is pretty much as it was ten days ago. So instead of wittering on and repeating myself, you can finish reading this earlier than you would have otherwise expected and go and do something a lot more interesting instead. Due to numerous problems (most of them involving the video of Mossley's goal) the report for yesterday's game with Rossendale will be online some time tomorrow. I'm sure that you can wait. I mean, it wasn't a game you particularly want to relive in a hurry, was it? What an interesting night last Friday turned out to be. And now that I've finally managed to thaw out, I can tell you about it. 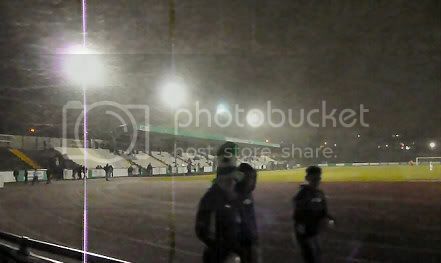 Howling winds, sub-zero temperatures, near decapitation by a garden bin lid that had blown over the Horsfall Stadium's perimeter fence, snow, heavy snow and then a blizzard. All before the piece de resistance: being held up on the motorway for fifteen minutes at Hartshead services by a trailer that had shed its load of (and I kid you not) hot tubs over two lanes. Oh yes, and in the middle of it all was a practice match for Bradford Park Avenue in front of the smallest 400+ crowd you've ever seen. Good Friday turned out to be anything but for Mossley as their latest trip to Bradford ended like their first at the beginning of the month - with a three goal margin of defeat. And not for the first time this season I find myself having to write that it could have been a whole lot worse. 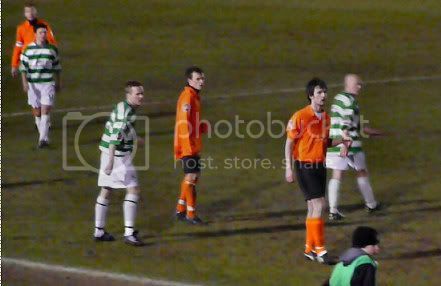 Getting any kind of positive result against promotion chasing Avenue was always going to be a tough task for Mossley but it was one made all the more difficult in the 15th minute when Michael Fish was shown a straight red card for an extremely rash challenge near the halfway line. It was definitely a case of from 'hero to villain' for the Mossley number seven as he had given his side a shock lead in the fourth minute of the match. Despite the chilling, gale force winds blowing across the pitch, Danny Ryan delivered a perfectly weighted free-kick from the left into the Bradford box that Fish stooped to head home past a surprisingly static goalkeeper. The advantage was to last barely two minutes though before Tristram Whitman drew the hosts level and from that point it was the home side that controlled the remainder of the game. Especially after the visitors had had their numbers reduced. Ashley Connor produced a series of fine saves to keep the Lilywhites in the match, including one tremendous point blank stop to deny Gedman, but just when it looked like the visitors might make it to half-time without conceding another goal Bradford put themselves in front. And once again it Whitman that did the damage. 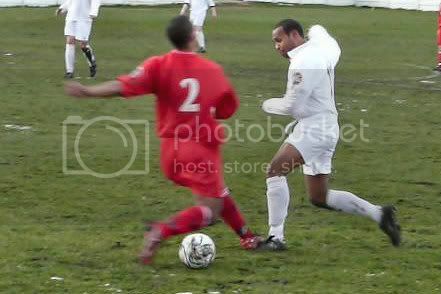 Picking up Gedman's intelligent flick on, the Bradford forward evaded the challenge of Mossley's last man Leon Henry and from the corner of the box he looped the ball over Connor and into the net. The visitors feint to near non-existent hopes of rescuing the game were extinguished immediately after the interval. After failing three times to deal with a corner, Gedman bundled the ball over the line and when Williams added a fourth in the 67th minute from a free-kick, the only question remaining was not if Bradford would win but by how many. Thankfully for Mossley one of the few bright spots for the Lancashire side on a dismal evening was that Bradford's fourth turned out to be their last, though they did go close numerous times to making the score line a more embarrassing one. 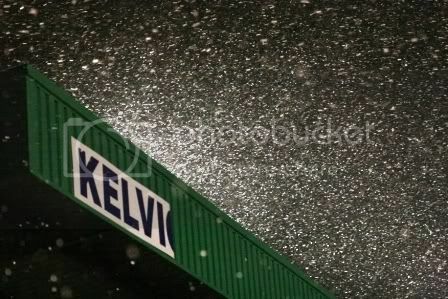 And when the few flakes of snow that were falling at the start of the second period turned into a blizzard with ten minutes of the match left, the tie was effectively over as a game of football. The phrase 'practice match' that I used somewhere near the beginning is probably a bit unfair but despite going ahead very early on, Mossley never really looked like they'd take anything from the game. The sending off didn't help us one bit (and it was a sending off) but its hard to argue that the scoreline would have been any different had Fish not received his marching orders. 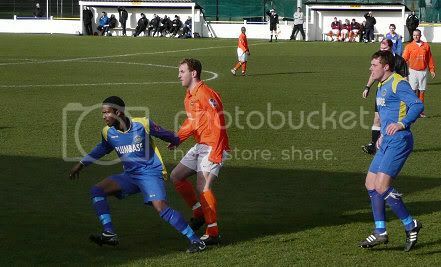 Even in the time between us going ahead and the red card it was one way traffic. One thing for certain is that there wasn't the 'galvanising effect' that you often see with teams that have a player dismissed while playing us – where it somehow becomes harder to beat 10 men than 11. There were some good performances, some not so good and some looked lost ploughing a lone furrow with little support. 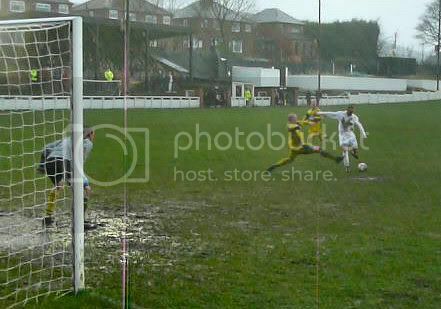 Unless you can keep the opposition out you need to score goals to win points and finding the back of the net is something Mossley rarely looked like doing. Once again the 'ten men' caveat can be used but if it wasn't for a very long range effort in the second half by Danny Ryan that bounced into the Bradford keeper's hands, Mossley's shots to goals ratio would have been 1:1. The end result for Mossley is not only another defeat (their twentieth in the league in this campaign) but the fourteenth in which they've lost by conceding three or more goals. With a final position in mid-table now looking somewhat ambitious, it's important that Mossley start to string a sequence of positive results together if they're not to end the season on the dampest of squibs. And if Jesus could rise from the dead in three days, I'm sure that Mossley can manage it in four in order to get back to winning (or even drawing) ways Rossendale at Seel Park on Bank Holiday Monday. A two game weekend means that to save time, it's a double header preview: long on waffle, short on facts. The first game is this Friday against the new Colne Dynamos, Bradford (Park Avenue), at the ridiculous time of 7:45pm. The Yorkshire side got their slowly derailing title challenge back on track with a victory over us on our first visit to the Horsfall Stadium at the start of the month. And with Curzon and Skelmersdale now trying their hardest to slip firmly into a play-off spot, Bradford now find themselves back in with a shout of achieving the goal they're paying a fortune to hit. I didn't pick Colne Dynamos because of just the money aspect though. As you may recall the Lancashire club imploded spectacularly when the clubs benefactor saw his dreams of glory thwarted by the realities of non-league football and you get the feeling that Bradford are another ticking bomb. There have been all sorts of shenanigans since we played them in the aftermath of their sacking of Benny Phillips. In the intervening period they've appointed not one but two managers. The first lasted the few hours it took them to find out that he was under contract elsewhere (something Bradford could have avoided if they'd actually told the club he was contracted to that they intended to appoint him), after which they appointed David Cameron. Yes, I know but any gag I could come up with would be just too obvious. The illegal approach made for Alfreton's manager was dismissed with a "So what" on the clubs forum and it's the kind of attitude that makes you think that not only are Bradford not going to make many friends, but should they hit a cul-de-sac on the pitch there's a risk that it will explode into a shower of bitter recriminations and a never ending repetition of the phrase "I told you so". The supporters who are already urging caution about grandiose plans such as a 20,000 seater stadium and league football are being met with low level abuse on the club's forum, but these will be the ones left to pick up the pieces, should any be left, if it all goes up a certain creek without an implement to direct yourself with..
Three days later on Bank Holiday Monday Rossendale United make the relatively short trip to Seel Park. It seems like an age has passed since we met them earlier in the season at Dark Lane, a meeting in which Mossley picked up their second win of the season; Martin Allison and Paul Quinn scoring our goals in a 2 - 1 result. Turning out for the Stags now is ex-Lilywhite Sergio Mario Daniel who has already caused us plenty of damage this season, being a major thorn in our side during that unholy trinity of games we had with Woodley Sports back in August. Prediction: Call me crazy but I think we'll get six points of six! How's that for positivity/blind optimism? What better to way to spend a night when the temperatures are near zero than to stand outside on an exposed piece of land and pay £6 for the trouble of doing so? 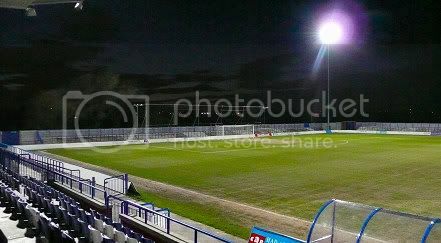 Desperate for a game of football I, and a few other like minded Mossley fans, made our way to the Tameside Stadium in the hope of seeing an entertaining game between the blue half of Ashton and Harrogate Railway. And we got 50% of what we wanted - a game. There's no question that Curzon deserved their win but they currently look a shadow of the side that was conquering all before them earlier in the season. The absence of Michael Norton may well have contributed to last night's stuttering performance and, in doing so, strengthened the beliefs of those who feel that they're almost a one man team. Whole I don't subscribe to that point of view you can't help but notice the huge hole that's left in the team when he's not playing. Harrogate were not unlike us (Mossley) in that everything fell apart in the final third of the pitch, and barring one shot from distance the Curzon keeper had one of those 'easy money' nights. Like I said though Curzon won, with a solitary second half goal, which is good news for Mossley as it stops Railway from putting further distance between themselves and us. If only they could have done it in a more entertaining manner. Yes, it was another boreathon and the third in the space of seven days for a small group of Mossley supporters after the Stalybridge match last Tuesday and the one at the weekend - a very unwanted hat-trick.. How boring? Well a considerable amount of time during the first half was spent discussing the Wakefield match (naturally), the food outlets on Ashton Moss, Spain, Lord Byron, renaissance art and why no-one appears to sit at one end of Curzon's main stand, to name but a small selection of the topics touched upon. Why does nobody ever seem to sit in the far right block of the main stand? In fact the best part of the night was the choice of music being played over the P.A. system before the match and at half-time. Having obviously put a 'one-hit wonders' CD in the machine, the crowd was treated to rarely heard delights such as Dee-Lite, Nena, Toni Basil, Chesney Hawkes, Charles & Eddy and Toto Coelo. Yes, I can honestly say that you haven't watched non-league football until you've seen a team go through their pre-match warm-up routine with puzzled looks on their faces as "I eat cannibals" blares out around the ground. And while I'm on the subject, if anybody from Curzon is reading this please turn down the volume of your speaker system. It's that loud (painfully so at times) that even if you shout at the top of your voice, you can't hold a conversation with the person stood next to you. Stood opposite the tunnel you can actually feel the vibrations of the sound as it echos off the back of the stand. It's genuinely unpleasant. So its not just Julius Caesar for whom the Ides of March turn out to be a seriously lousy day. The fifteenth day of the third month has always been seen to be portentous and if old superstitions are true, the omens Mossley will take from this game aren't particularly good ones. With eight games of the season left, and all but one against teams currently above them in the table, Mossley are going to have rediscover the form they showed against Chorley quickly or else more performances like this one will see them enter the race for the wooden spoon, or possibly worse if the league do decide to press ahead with relegation this summer. There was a distinct case of 'after the lord mayor's show' about proceedings at Seel Park on Saturday as Mossley followed up their battling display against the Magpies, and one which saw them register their first victory of 2008, with the kind of showing that had seen them go the ten games prior to it without a win. Much as they'd done in the meeting between the two sides a fortnight earlier at their Eastmoor Road ground, Wakefield claimed a victory against the Lilywhites with two second half goals. And unlike then when Mossley were somewhat unfortunate not to leave with at least one of the points on offer, this time round the Yorkshire side deserved their spoils, even if the goals that won it did have a stroke of fortune about them. The first half was a monumentally dull affair - the epitome of a dour, midfield battle and but for two superb saves by Mossley keeper Ashley Connor, it wouldn't be worth mentioning at all. His first stopped Chris Hitchings from putting Wakefield ahead quarter of an hour into the game and his second, twenty minutes later, left Graham Marchant slack jawed in wonderment at how he'd managed to divert his attempt, that looked destined to drop into the net, over the bar. The home sides efforts at drawing similar heroics out of Connor's opposite number, Andy Woods, amounted to nothing more than two half-chances from Michael Fish that were shepherded off for goal kicks and a header that bobbled into his arms following a corner. A hooked shot from Michael Fish drops over the crossbar under the watchful eye of Woods; the closest Mossley came to scoring in the entire 90 minutes. Compared to the second half though Woods was being positively overworked as the forty five minutes that followed the interval saw Mossley register one single shot on target; the closest they got being a diving header from Fish that was blocked before it went anywhere near the six yard box. Unfortunately the visitors weren't having any such trouble at the other end of the pitch. With Mossley remaining firmly stuck in neutral, the extra gear Wakefield appeared to have found during the break saw them begin to ask more and more questions of their opponents. Despite their best attempts to break the deadlock though, it was to be two defensive errors that they'd capitalise on to win the game. In the 54th minute Delroy Ferguson took advantage of Lee Connor's hesitancy in heading off a loose pass to break clear of the home defence and slot the ball under the Mossley captain's namesake to put Wakefield ahead. Both his and his sides second goal came courtesy of a similar error half an hour later, only this time it was Paul Quinn who failed to make the crucial and relatively straight forward interception, once again allowing Ferguson all the time he needed to compose himself and pick his spot past Connor with the ball. On one of the occasions Ashley Connor is actually beaten, the crossbar comes to the rescue. The only positive for Mossley on the day was that the final scoreline wasn't nearly as bad as it could have been. And the fact that they weren't on the receiving end of a much heavier defeat is down to a combination of a string of saves produced by Ashley Connor that bettered the ones he made in the opening half, some errant finishing by the visitors and, on one notable occasion, the woodwork. Overall this was a hugely disappointing showing from Mossley - from the sublime to the ridiculous in the space of a week. Other than a few notable exceptions, it's hard to believe that it was the same eleven that did so well in the last home match. As Roy Walker used to repeat mantra-like on Catchphrase, "Say what you see," and what I saw was pretty crap. And in private, away from the terraces and the internet, I think that's what many of you will believe as well. If you're able to make the result more palatable by believing that the only difference between the two sides were the two mistakes, then fair play to you. From a personal point of view I think being happy that we might have scraped a 0 - 0 draw at home to a mid-table side had it not been for two errors (the likes of which haven't exactly been rare occurrences this season), a spectacular display by our goalkeeper and some lax finishing from our opponents, is a desperately small straw to clutch at. I've no doubt that some of you reading this will be tutting to yourself in the belief that I'm being overly harsh but is it really too much to ask that the opposing keeper at least gets his kit a bit dirty? That we not put in an end of season performance with eight games left and safety still not an absolute certainty? With two tough games coming up over the Easter weekend that winning mentality is going to have to return pretty sharpish. Will the real Mossley please stand up? This Saturday Mossley get the chance to mete out some swift (well swift-ish) revenge as they take on Wakefield, a mere two weeks after they last faced them and lost to what was virtually the last kick of the game. 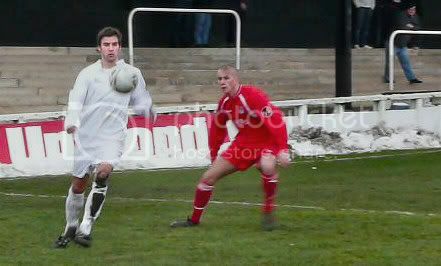 A lot has happened in the intervening fourteen days though, not least the fact that Mossley won their first game of 2008. While one win can hardly be construed as 'a roll', the victory over Chorley will certainly give the Lilywhites a bit of momentum as the season approaches its closing moments. Four places and 12 points currently separate Mossley and their more highly positioned guests, but 6 of those points can be clawed back in the two home games we're yet to face our Yorkshire opponents in. That's a big but though as Wakefield are currently the form team away from home having taken 15 of the last 18 points possible on their travels. Indeed, if it wasn't for their performances at Eastmoor Road they'd almost certainly have been mounting a significant push for automatic promotion rather than hoping to catch a play-off spot. Prediction: Two in a row - a win for the home side. 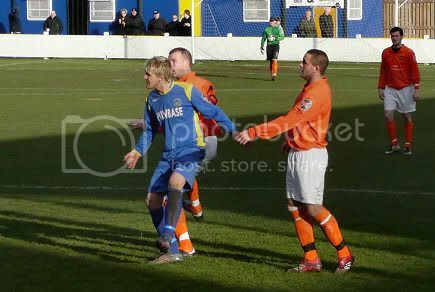 Do you see what I did there by cleverly combining the name of Stalybridge Celtic's ground and the fact it was very windy? I'll readily admit that it isn't the greatest pun there's ever been but it's the only attempt at humour you're going to get in this little piece. You see it's because I'm still bored: monumentally so after watching our aforementioned neighbours take on Alfreton Town in a Blue Square North game last night. The 3 - 1 scoreline in the home sides favour might suggest that an exciting game took place but believe me when I tell you it didn't. What it was in fact was a one sided game were that one side didn't really have to do much. Bridge took the lead not long after kick-off through Steve Torpey after a mazy dribble took him through some spectacularly slack defending, and just before half-time they added second when Ashley Wynn hit a nice volley from just inside the Alfreton box. The second half was similar with Torpey adding a supremely well taken third almost immediately after the restart (lobbing the town keeper from a good 45 yards out) while the visitors wrapped up the scoring with not much of the match left to play. In between not a lot else happened. Alfreton looked like a side going through the motions, which is no real surprise considering their manager tried to walk out on them a couple of weeks ago to join Bradford Park Avenue, and Stalybridge's attempts at running up a cricket score were continually being hampered by a strike force performing that old music hall act of trying (and failing) to hit a cow's bum with a banjo. Celtic even gave Alfreton a chance three quarters of the way through by replacing half of their forward line with someone who wasn't much better and sticking former Clitheroe full-back Simon Garner in the centre of what was their dominant midfield. I've actually never seen him play in central midfield before and, to be fair, I didn't seem him play there last night either. And unless his role was to keep giving the ball away I don't think anyone will see him play there again either. I'm sure that if I was a Blues fan I'd have found the game to better than it actually was but as a neutral, it was a match that left you looking at your watch in the hope that it was finishing soon. Or at least it would have if it wasn't too cold to keep taking my gloves off and rolling up my sleeve. Match - mostly dull with the occasional highlight. Stalybridge Celtic midfield - very, very good. Are you sure - yep, 'felt sorry for their small band of travelling supporters' poor. Officials - contrary to the Celtic fan sitting in front of us in a continual state of apoplexy, they were good. Steward clearing footballs off the roof of the stand in gale force winds during the interval - absolutely mad! Just when their win less run was beginning to resemble Tony Curtis's arm in 'The Vikings' after he gets his hand chopped off (in that it was getting longer every time you looked at it*), Mossley finally claimed their first three point haul of 2008 with a hard fought, but ultimately deserved, victory over a Chorley side that had beaten them rather too convincingly just a month earlier. As has often been the case during that ten game win less streak that stretches back to the last week of December, Mossley began the brighter of two sides on display with Martin Allison, David Boardman and Danny Ryan all going close to putting the hosts ahead in the opening ten minutes. 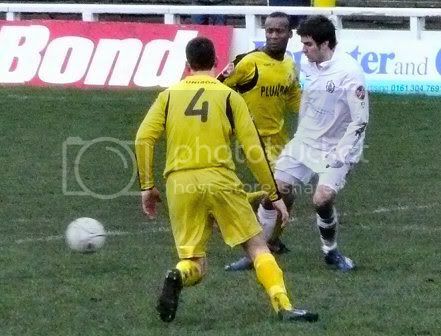 The latter in particular was having an impressive start to his debut in a Lilywhites shirt and it was from one of the numerous crosses he fired in from the left wing that Mossley opened the scoring; Michael Fish diving full length to head the ball past Magpies keeper Peter Collinge in the 11th minute. It was lead that was to last barely a minute though before as Magpies drew level with their first shot real in anger of the game, and it was a former Mossley player that did the damage. Centre forward Steve Burke letting fly with a venomous shot from the edge of the box that took the slightest of deflections off Lee Connor before hitting the back of the net. The midway point of the half saw David Boardman restore Mossley's lead with a smart turn and shot from the edge of the box after a quickly taken throw-in appeared to catch Chorley's defence half-asleep. All three goals scored up to this point had been pretty impressive but they were surpassed on the stroke of half-time. From a full 30 yards out, Martin Allison struck an inch perfect free-kick that not only had Collinge flying across his goal line in a forlorn attempt to stop it from dropping into the net, but gave Mossley a two goal cushion that they richly deserved going in to the interval. Its behind you! Peter Collinge fails to stop Martin Allison's free-kick. While the weather hadn't exactly been 'clement' in the opening half of the game, it was certainly preferable to the conditions both sides found themselves playing in at the start of the second period. The strong wind that had been blowing across Seel Park was now joined by torrential rain and as water swept across the rapidly deteriorating surface, both sides, unsurprisingly struggled to produce anything other than the occasional half chance. A small taster for those who weren't there of what the 'drizzle' was like in the second half. That remained the case until the 70th minute when, with the deluge beginning to ease off (if only slightly), Mark Drew halved Chorley's deficit with a 25 yard free-kick; practically his first touch since coming on as a substitute. After having been in control for so long Mossley began to wobble slightly as the Magpies started to throw more men into attack in search of an equaliser. Ashley Connor was called on to make a superb point blank stop from Burke and the Chorley striker had his embarrassment spared by an offside flag after poking the ball wide of a virtually open goal. Two minutes from time the outcome of the game was put beyond any shadow of doubt when Martin Allison stroked home his second and Mossley's fourth goal of the afternoon from the penalty spot. The kick awarded after man-of-the-match David Boardman had been felled by Collinge as he attempted to take the ball around him. Which Martin Allison calmly puts away. Well, what can you say when "well played" and “well done” isn't enough? This was a stirring performance from the men in white (and dirty grey and brown by the end of the match) shirts and a world away from the one witnessed by the 'unlucky few' against Bridlington four days earlier. Not only did heads not go down after Chorley had pulled the game back immediately after we'd scored but we continued to battle and battle hard without picking up silly bookings. Of course, we weren't playing a top of the table side but Chorley are certainly no mugs under their new manager Tony Hesketh and anybody who plays them is certainly going to have to work hard for the points. Which is precisely what Mossley did. 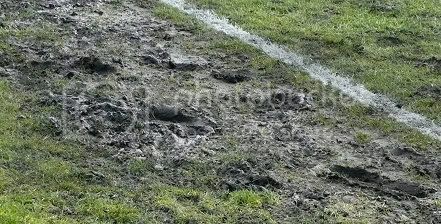 In fact both teams deserve plenty of credit for producing a game that never failed to hold the attention, especially given the atrocious conditions the match was played under. It might have been a victory that was long time in coming but with more performances like this one, it certainly won't be another eleven games before Mossley are celebrating claiming another three points again. * Despite it being a very good film, it is worth watching just to see Tony Curtis's characters stump grow bigger the longer the film goes on. In the climactic fight scene his handless arm is almost half as long as the one with fingers on the end. As Monty Python bores will tell you between Nudge-Nudge Winks-Winks, Ni's and choir invisible's, “No-one expects the Spanish Inquisition”. Especially when you're phoning a call centre in Newcastle. At least that is what it was like when I phoned up Orange in an attempt to get them to send me my broadband migration code. Virtually every sentence from the opposite end of the phone began with why. : Why this? Why that? Why when? Why where? Why? It got to a situation that was not unlike that famous moment on Newsnight when Jeremy Paxman kept asking Michael Howard the same question about a prison governor. But instead of “Did you threaten to over rule him?” it was me continually repeating the mantra “Could I have a MAC code please?” with increasing weariness. After finally being called crazy for not accepting the “fantastic deal” being offered to keep me as a customer, I was curtly told that my code would arrive by e-mail within the next few days*. By this point you're probably asking yourselves what any of that has to do with the price of fish, so I'll tell you. The time I've spent doing the above (and listening Amy Winehouse singing 'Valerie' while being transferred to various departments in two different parts of the globe) is the time I normally write the match preview, and that's why it's going to be shorter than usual. “But couldn't you have spent the time writing the opening five paragraphs (and this one) doing the preview instead?” Well, yes I could have but... but ... ... oh flip! The Magpies arrive at Seel Park with Mossley at their lowest ebb of the season: 10 games (almost a third of our current league season) without a win and coming off the back of a spanking at home to the team second from bottom of the league. In fact it's the kind of situation Chorley themselves were in when we made the journey to Victory Park a little over a month ago. Not only were they struggling for points, they went into that game a mere three days after being whupped 7 – 0 and, in the same time frame, had sacked their management team and appointed a new one. The result of which was a rather convincing 3 – 1 victory, despite Mossley having taken an early lead. 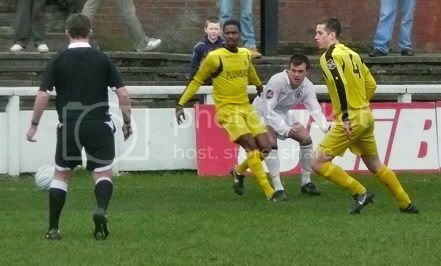 The thorn in Mossley's side that day (or to be more precise, night) was ex-Lilywhite Steve Burke who scored two of Chorley's goals and could, and probably should, have had a few more. Since that meeting Chorley have managed to put a bit more distance between themselves and the foot of the table (they're unbeaten in the last five league outings) and now sit two points and a place below us in 14th spot. Now I'm off to try something far easier than getting my MAC code off Orange like extracting blood from a stone or managing to sit through an episode of Most Haunted Live without shouting “charlatan”, “gullible idiots” or “why the hell am I watching this crap?” at the screen. Prediction: I have a strong gut feeling about this one - a win for Mossley. * Credit where credit is due though, I've received my code just a couple of hours after requesting it. Apologies for the late arrival of this match report but I've been out getting a T-shirt printed bearing the slogan - 'I stayed until the end of the Mossley – Bridlington match and I wasn't even playing!' because there weren't many of us that did. Yes, just when it looked like things were clicking into place once again following the week end showing at Wakefield, Mossley's season took another disastrous turn for the worse. Well at least it did if you're just going off the scoreline. On the face of it there's no denying that a 5 - 2 defeat at home, to the team currently second from bottom of the division, is an embarrassing one. Especially when you're trailing by four goals at the interval. The full picture however is not entirely one of doom and gloom as the Mossley performance in this game was light years ahead of those witnessed in the similarly heavy defeats against Lancaster and Skelmersdale, and even some of the more recent ones where we've lost by the odd goal such as Harrogate. Not that that really makes the result any less of a bitter pill to swallow or hide the fact that the warning signs are flashing. The match almost got off to the perfect start for the Lilywhites when, with just twenty seconds having elapsed, Adam Morning bounced a shot off the right hand upright. A little over three minutes then went past before the same post was hit again, this time by Gareth Hamlet following a goalmouth scramble. Unfortunately for the Lilywhites though these efforts sandwiched Bridlington's second minute opener - a stunning strike by Gowens from the right wing that left Ashley Connor rooted to the spot as it arced around him and into the net. That said he was still seeing more of the ball than his opposite number at the other end of the pitch so it came as something of a surprise when Town doubled their advantage in the 22nd minute. The first goal was good but the second was even better. Receiving the ball a good 35 yards away from goal, Fleming hit a thunderous drive that evaded Connor's vertical leap before dipping under the crossbar and hitting the back of the net. 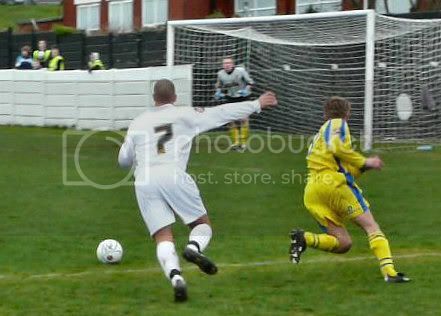 Lee Blackshaw races past his marker in a photo that for some reason gives me a headache if I look at it for too long. If the first two goals were 'wonder strikes' that little could be done about, the same can't be said for the next two. Mossley's failure to adequately clear their defensive lines following a throw-in led to McGarry adding a third for Bridlington on the half hour mark, and on the stroke of half-time the same player was given the time and space to make it four with a low shot from the edge of the penalty area. Mossley finally managed to get on the score sheet in the 53rd minute whren Martin Allison's attempt to charge down a clearance was rewarded after the ball ricocheted off him and into the net. And when the same player pulled another goal back from the penalty spot seven minutes later, it suddenly looked as though Mossley were about to fashion a remarkable comeback. 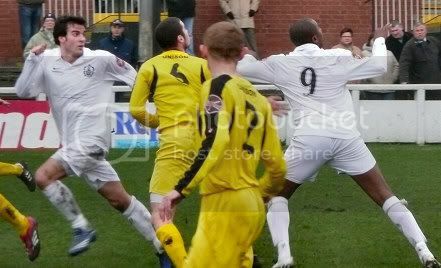 Martin Allison (partially hidden by Darren Royle) bundles Mossley's first over the line. That optimism lasted for less than two minutes. Taking advantage of a huge gap that opened up in the home defence, Gowens made his way towards the edge of the box unchecked before slotting the ball past Connor for Town's fifth goal of the night. To Mossley's credit though they refused to lie down and die. Right up to the final whistle they continued to enjoy plenty of possession and created a host of chances, but just as in the first half (and many games prior to this one) the lack of any kind of accuracy meant that the deficit in the score remained at three. At a push (and it's a big push I'll admit) you could say that we were a trifle unlucky. We could play Bridlington every day from now until Armageddon and I doubt they'd ever score two more like the first couple of goals in this game, or indeed find the net with all five of their first half shots (one was disallowed). People with their feet grounded in reality though will say that you make your own luck in football. So until Mossley start to get more than the odd shot on target per game and stop giving away soft goals, we'll continue to make our opponents luck for them. To be honest the most disturbing thing about the night was not the result but pitifully low attendance. I appreciate that some people have more pressing concerns to attend to and that others with no access to the internet were unaware that a match was taking place but over a hundred of them? Then again maybe last night was as bad as it seemed and I'm simply in a state of denial but one thing is for sure, the upcoming Chorley match is now bigger than a huge thing that's standing on stilts and wearing a large hat. To be perfectly honest, I can’t work up the enthusiasm to do a fourth preview for a home game with Bridlington, especially as much of what was written for that last scheduled meeting is still applicable. So if you’re interested (and the site statistics say you're probably not) click here. I’m now going to use the time I would have spent writing it wondering why, of the two video clips I posted of the Wakefield game, the viewership of the 'near misses' is more than triple that of the goal we scored. Nevertheless, a big thank you to everyone who has taken the trouble to watch them! 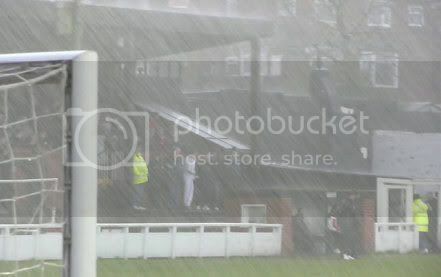 Football can be a cruel game at times as Mossley found out to their cost at Wakefield's windswept College Grove ground. The White Rose county hasn't been a particularly happy hunting ground for the Lilywhites on their travels this season: a solitary draw being their best result in six games on Yorkshire soil. And it's a statistic that failed to improve after their latest trip across the Pennines. Not that it wasn't for the want of trying as Mossley produced some of their best attacking football for months but the long standing problem of failing to make their dominance count was to once again prove costly. Still searching for their first win of 2008, Mossley lined up with an attacking 4-3-3 formation (or if you want to look at it with a more conservative eye, a 4-5-1) but the biggest surprise was the inclusion of Adam Morning - the former Manchester City youngster making a return to the club after leaving in the summer of 2006. As has been often the case in their current win less run, the Lilywhites exerted an enormous amount of pressure on their opponents in the opening stages of the game but with little in the way of shots on goal to show for it. However, after Lee Blackshaw and Wakefield's Jay Sobers had traded long range shots that gave both keepers cause for concern, it was the formers side that upped the ante. Ashley Connor deals with a rare moment of worry in the first half. Chances soon turned from a trickle to a stream as Blackshaw and Adam Morning, both players continually swapping wings, began to torment and open up a home defence that soon discovered the best way to stop them was to foul them. Well it was on the occasions that they weren't left sitting on their backsides wondering how a tangerine blur had tied their legs in a knot. However, Andy Woods in the Wakefield goal was proving to be more than a match for anything that Mossley could throw at him. Despite the best efforts of ex-Lilywhite Will Ryder, Adam Morning's corner crosses the line. As football clichés go, 'a game of two halves' is a particularly hackneyed one but one that sums up this match perfectly. If the first period belonged to Mossley, the second most definitely belonged to their hosts. Two minutes after the restart Sobers outlined his sides intentions by evading a series of challenges before unleashing a thunderous shot that cannoned back off the goal frame. Mossley's response was their two best (and only) opportunities of the second period and both came within a split second of each other; Lee Blackshaw having an effort headed off the line and Dean Johnson half-volleying the clearance narrowly wide of the right hand upright. Other than that the Lilywhites had little else to show for the amount of possession they held around the box. The longer the half wore on the more Wakefield's better levels of fitness began to tell and after playing second fiddle for a little under an hour, the home midfield began to control the game, Sobers in particular playing a huge role in proceedings; instigating the majority of the home sides attacks and having a role in both of his sides goals. 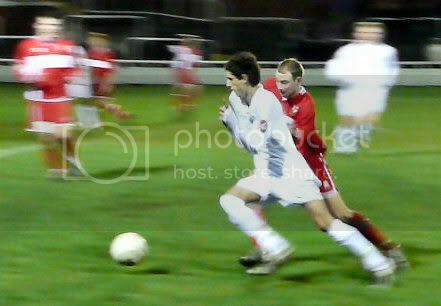 The first coming in the 65th minute when Chris Howarth looped a left wing cross over Ashley Connor from close range. Wakefield proceeded to squander a succession of chances through a mixture of their own ineptness at finishing and some good Mossley defending, it looked as though the Lilywhites had done enough to earn themselves their first point on their travels for three months. 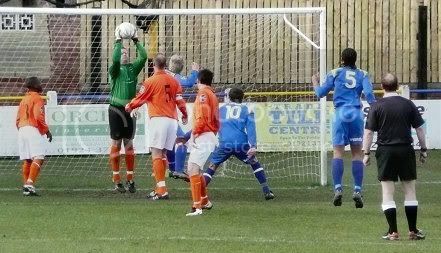 Especially when substitute Ferguson fired tamely wide from a very good position in the 90th minute. Unfortunately it wasn't to be the last chance. Deep into injury time and with the full-time whistle only seconds away, the Lilywhites conceded a soft free-kick midway in their own half. Sobers fired the dead ball towards the back post where centre half Wes Milnes directed it past Ashley Connor to give the home side victory with virtually the last touch of the game. Wakefield's last touch of the match heads towards the net. If you were to look at the game from a negative point of view, the failure to create more than a handful of good goalscoring opportunities that made the opposing keeper stretch himself a bit is a problem that refuses to go away. However, it's from a positive perspective that I choose to reflect on this game (not bad for a long time pessimist, eh?). Every player in a Mossley shirt gave their all and there was enough evidence to suggest that there's a corner ahead which we're going to turn soon. In fact for the first time in 2008 I came away from a game feeling incredibly optimistic. And should an enormous financial windfall ever befall me, I promise to build a hockey pitch by the side of Seel Park. Not only is it a good game to watch (it's football but with sticks) but there's money to be had from charging Mossley's dirty mac brigade a small fee to watch it! At the end of the day, whilst it's hard not to feel despondent at such a late, late defeat, I think everyone can take a lot of heart from this performance, the Lilywhites best for some considerable time. Now we've got to see if we can repeat it against Bridlington and Chorley in what is going to be an important week in Mossley's season.